Service is the rent you pay for having room on the Earth. This was the fortune cookie I got after attending the 89th Connecticut FFA State Convention at E.O. Smith High School in Storrs. I spent the day there watching and listening to these students and I was amazed with the energy, public speaking, and teamwork that these FFA members give. I sat in on their Convention and witnessed an engaged group of students working toward a brighter and better future. They awarded 146 State Star awards, the highest award at the state level. There are 3,300 FFA members with 20 chapters in Connecticut. They elected new officers and I congratulate them for a successful year. Michael Wetherell of Killingly is the new President of the Connecticut FFA Association. The energy of the election and installation of new officers has the feeling of the Price is Right TV show. Let all of our Granges invite these FFA Chapters to put on a program in our halls. They are willing to come to us. You just have to ask. Echo Grange Hall has been sold and Litchfield Grange Hall will be by the printing of this issue. 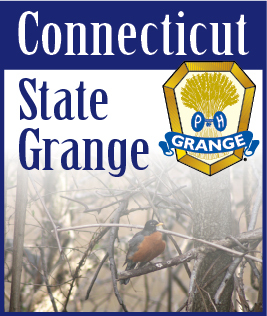 This is a difficult thing that I have had to do as your State Master, but it is necessary that we not have empty Grange Halls around this state. Everyone should be working to bring in new members. Materials are available from the membership committee. Call them and they will assist you with a membership drive. Mentor new members so they have someone to answer questions and feel welcomed into the Grange. Remember what experience you had as a new member. I want to thank the Worthy Chaplain for his Sunday Worship Service on Grange Sunday though the participation was lower than previous years the sermon was enjoyed by all there. The Let’s Celebrate Day had fewer entries in the Photo and Needlework Contests but as we talked about it, the new Pomona Granges are getting a late start and were not able to spread the word as in past years. Next year will be better. The Youth and Juniors had an excellent luncheon with soups, salad, Subway and dessert. The local Subway in Cheshire donated the Subway sandwiches to the Junior Grange so a bigger profit will go to the Youth and Junior programs. Thanks to all that attended. The skits and A-Numbers were fewer than in previous years. I thank all Granges that had a number to present in the afternoon. After the contest a comment was made about some of the skits as being offensive. One had the mention of transgender, from a Grange member who has come out in life as a transgender. The comments were this was not appropriate for a Grange skit. I disagree because the Grange is a family organization and we should not and she should not discriminate against anyone for their beliefs. We should not judge people for their lifestyle choices, that is God's duty on Judgment Day not ours. The other was religious themed skit of shouting Bingo numbers instead of giving last rights. I'm sorry but this is a skit, it wasn't in bad taste. I thought it was funny. This time in this country we cannot laugh at ourselves without offending someone or something. Fair season is here so go out and promote the Grange, new members are out there they just haven’t been asked. Talk about your experience with the Grange and bring in that next member. Good luck and have a safe summer.